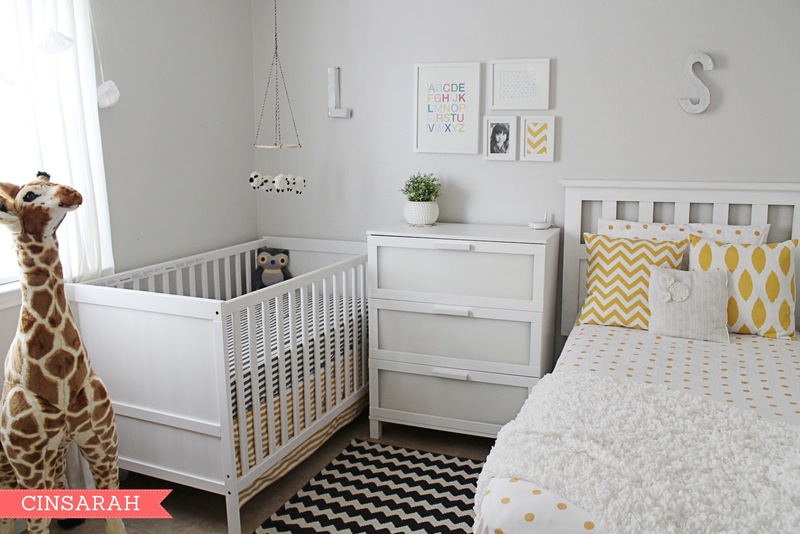 In case you missed it: Levi + Sarah's Shared Nursery/Room was featured on YOUNG HOUSE LOVE yesterday! I was SUPER EXCITED, THRILLED & HONORED for the feature on John & Sherry's amazing blog! Their blog is one of my favorites! Then, I began reading the comments and I got a horrible sinking feeling in my stomach as I began to read some of these comments that weren't very nice over color changes in this room. All of a sudden my excitement turned to sadness. I feel sad. I feel judged. I feel hurt. I don't take mean comments very well. I am a worrier and I think things over in my head so much it makes me sick. I shared this a little more about that in this post. Don't get me wrong I read ALL of the sweet comments as well and I want to say THANK YOU SO MUCH to those who left a sweet comment letting me know you liked the room! I feel I don't NEED to explain but I will because people like to jump into conclusions without even knowing and then in return leave a mean and judging comment about it. Here is a design board I had created that had both pink and blue in it. I have no problem with colors. The reason I removed the pink was more because I found the sheep mobile and girraffe and fell in LOVE with both and wanted the room to look clean and put together to include both of these. I showed the design board to my daughter and she LOVED it! She is not sad that I removed the pink. She loves her room and her polka dotted sheets. She loves the girraffe which is currently sporting a pink hula skirt by the way. There's a saying "If you don't have anything nice to say, don't say anything at all." I can already hear a reply "This is America and I can say anything I want"
I understand that but if people would just think before they talk/comment there would be a lot less hate in this world. Words can hurt way more than you think. Someone could be having a bad day or a bad week and hearing/reading mean words/comments would only make things worse. For what it's worth, I think your redesign of the room is beautiful, and very gender-neutral! Lucky kids to have such a pretty room! I'm commenting again really soon but because I'm just so sorry! All that really matters in a nursery, or in a home for that matter, is that your family feels loved and comfortable. Your nursery is adorable. Colors of a nursery- what a terrible thing to hurt another person over. Especially when they've been picked with such thought and love. Enjoy the space you've made and let those proud, insensitive comments roll off your back. don't be sad Cindy... I love the share room you created. you put a lot of thoughts and heart into it...your children love it and lucky to have such a mom. don't let negative comments affect your mood. Thank you very much Megan for your comment!! people are judgmental and ridiculous. everybody has an opinion and for some reason they each feel it needs to be heard and taken into consideration, regardless of anybody's feelings. your room is beautiful. i would have taken the pink out too. not because i think it would make a baby boy uncomfortable, but because the first design was for your little girl alone. this design is for both children, taking them both into consideration instead of just one of them. pink has nothing to do with it. forget those jerks. you love your room and so does your toddler. i am sure the baby will too. that's all that matters. I saw your feature on YHL, and checked out your blog after seeing the feature. If it makes it hurt a little less, you gained a new reader. I think the room is fantastic and so is your blog! Well, I love it!! It's pretty much the same color scheme I used for my daughters room! I followed your blog after seeing you on YHL too, and am gonna keep reading! I found your blog yesterday (new follower!) through YHL. And I'm so sorry about all the comments! I didn't read through them, so I was actually surprised to see this post this morning. I think the room was fabulous with the pink for your daughter... but the new room is so. much. better. Really! I love the simplicity of colors in there. In fact, I'd like to live in this room too. Fantastic job! And try not to let the mean words get you down. You did a great job, mama! so sad to hear that anyone had anything negative to say about such a pretty, clean space for your two children. i think you did a great job. i love the crisp look of the white with the different prints and patterns. i'm sure both of your kids are loving their shared room. You know what...It's your house and your children's room!! If someone doesn't like it then they should just leave the site they are one with out leaving a comment. Everyone has different tastes about color and style...we are all different. I think the room is bright and cheerful. And if your kids like it that is what matters because it is their room not the negative peoples. Don't worry about what others think!! If you like it and the kiddos love it then it is absolutely PERFECT!! Here is a Hug for you ( ). Have a great rest of your week. and I follow your instagram now I am @rissecobb. I love little levi's hair. I am a little obsessed probably! I found your blog through YHL. I love the room! It is so adorable. It makes me want to re-decorate my daughter's room!! I am so sorry, Cindy! I never read comments (or leave them), but wanted to do so here because I just loved your shared nursery space, and was so happy to pick up another adorable, inspiring blog to read! I subscribed to your blog after reading yesterday's post. The room is beautiful! I love this room. I think that maybe when people comment on Young House Love they are just thinking about how they would decorate it, but it's not about how they would do it, it's about what you want this room to be. And I think that it's perfect for a shared room! I love your shared nursery; it is beautiful. Pink or no pink, princess or no princess. I don't think people realize that what they say can be so hurtful. I also love the idea of the little ones sharing. We have a three bedroom also and I was thinking about how we would work it one day! I think this is one of the worst parts of blogging. Ever. We throw ourselves out there and then some mean comments from people who just aren't thinking that real people are behind the work ruin everything. I recently had something similar happen and I must say, I suddenly realized why so many famous people say they don't read anything about them in print or on line. It makes total sense because while there is so much good to say, the negative comments tend to be the ones that stick with you. You are fantastic and your nursery space is adorable. That's why you got picked up by such an awesome blog and I was thrilled for you when I saw it in Young House Love. The mecca of all design blogs. I am one of the people who commented on the post yesterday on YHL stating that I thought it was sad that you didn't feel as though you could keep the pink in the shared room. I have read through all comments over there and while I will say that some were more critical than others I don't see anything down right mean. I think the misunderstanding came from your wording on the matter. "I tried to re-use many of the items I had purchased for the first makeover but sadly had to take all of the pink away and store it." That statement implied, to me at least, that removing the pink wasn't something you wanted to do..but instead felt you had to do with the addition of a boy to the room. Remember that many of us over at YHL were unaware of the backstory and other mood boards. I am glad to hear that the removal of the pink had less to do with the addition of a baby brother and more to do with room design/feel. The room turned out beautiful and I don't think anyone ever disputed that. I am glad that it's a room that your daughter loves and I am sorry if you felt offended by comments that I don't think were meant to be so hurtful. I am with you! I found it ridiculous to imagine that a mostly colorblind newborn is already gender insecure, and demanding that pink be vanquished from its presence! I love both rooms, but the ideology behind them frightens me- princess? In 2013? Really? I don't think I even have to explain why it is. Just put yourself in my shoes and then read this as if it was written about you and your own daughter. I understand that my original e-mail said I was sad that I had to removing the pink. I feel people read too much into that single sentence. The reason I was sad was because I had just purchased those items, I had fun with the first makeover (which was intended for JUST my daughter) but "had" to put them away because they no longer fit with the new design board I created for BOTH of my children. Either way, wether someone feels pink is for boys or not. I don't feel it's right to criticize someone for their beliefs & choices. Although some of those comments didn't mean to be hurtful they were to me. Everyone is different and everyone takes comments/words differently. Some may not be bothered at all hearing/reading criticism and others may take every single word to heart. Hi, I am here from YHL and I must say I love, love the old bedroom and new one. They are both beautiful and so is your blog. Hi there! It's really a shame that people feel so emboldened to say rude things on the web than they would have the courage to say to someone face-to-face in real life. I actually liked the 2nd room better than the first. But even if I hadn't 1) it's your house and you can do whatever you want with it, and 2) I also believe that "If you don't have anything nice to say, don't say anything at all.". Be encouraged and thanks for addressing this! Haters gonna Hate! The room looks amazing and I LOVE IT! I am so sorry your feelings were hurt, unfortunately this days common sense is the most uncommon of senses, and just like you pointed I wish people like that would just say nothing at all... but then again... we can't control it, so I hope you just pretend those comments were never there. Thank you for sharing this beautiful room with us, you have done an incredible job! xoxo and Greetings from South America! It is sad that there are so many trolls on the internet. While constructive criticism is one, thing just saying mean, hurtful things is a reflection on the people that post them, not of your work or you. I love how it looks; ignore the haters and don't give the comments credence by posting them - delete and ignore them. Hi, Cindy! I must say, I LOVE the new room! :) It's funny you removed pink because for baby #4 (a girl), I have not put one pink thing in the nursery! You'd think after 3 boys, I'd be all for pink, but I, too, am going the yellow/gray route! There is a chance DS3 and DD will share the room sometime in the future and I am the kind that tries to think ahead a little! :D The critical ones out there find it personally easier to force their opinions on others rather than offer a simple compliment or word of encouragement! That would be too easy. It's amazing that in today's world, there are still plenty of narrow-minded individuals lurking out there. Hugs! Love the nursery. Have a similar situation at our house with a boy/girl shared room and a little tweaking to remove the pink. Never occurred to me that's a problem. My daughter loves her blue and white room instead of blue and pink. Keep on keeping on with your great design! !